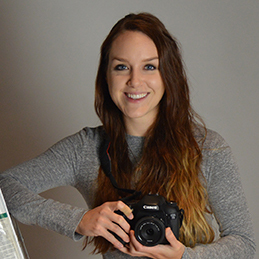 On August 1, 2016, photography senior Andrea Kennedy starts her internship at the NES Artist Residency in Skagaströnd, Iceland. Kennedy secured this internship opportunity through a connection Jen Pepper, associate professor of art and design and director of the Art Gallery, made with the NES staff during her sabbatical last fall. "Andrea Kennedy's international internship will no doubt be invaluable to her, the folks at NES Artist Residency Program and to the college," commented Pepper. "The location is an exciting place to live and work and Andrea will be working alongside 14 international visual artists. Her far reaching knowledge in photography (both film and digital formats) will provide NES with cutting edge practical knowledge that will give future artists to work thoroughly in the discipline." During the internship, Kennedy will photograph the residency, various artists, the village of Skagaströnd and the beautiful surrounding area. The images captured will be used for promotional outreach on the NES website and other materials. Kennedy is also responsible for creating a short promotional video and creating a basic dark room in the facility. Kennedy is preparing to travel to Iceland and start her once-in-a-lifetime opportunity. "I am very excited to be working with such a diverse group of artist in a beautiful location. I know this experience will be an amazing chance to improve my professional skills, as well as provide promotional materials and artistic resources for the residency. I am very luck and grateful for this opportunity," said Kennedy. Learn more about Kennedy’s internship experience through her NES Artist Residency internship blog.